"This is a simple recipe that's not too sweet. You can also double the recipe and bake them in flat bottomed ice cream cones!" Preheat oven to 350 degrees F (175 degrees C). Lightly grease or line 12 muffin cups. In a large mixing bowl, combine the flour, baking powder, sugar and salt. Stir in the milk, egg, butter and chocolate chips. Pour batter into prepared muffin cups or flat bottomed ice cream cones. 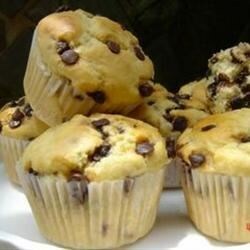 Bake in preheated oven for 15 to 20 minutes, until a toothpick inserted into the center of a muffin comes out clean. Unfortunately this keeps being too wet a dough for me. Already tried to keep it longer in the oven, didn't really work. Now I will try less fluids, but the taste is really GREAT!!! I made it to include in a mother's day breakfast, but it just did not turn out. Not sweet enough and not a good texture. Was a little better later after it had been refrigerated. This recipe seems totally wrong amounts! I should have read the reviews first, because I probably would not have made it if I had. It was so liquidy, had to add heaps more flour.